Click here for an interview with Kenneth Jones about my new play Speculator Spirits. Here’s an article about the workshop I’m doing next week in at the Pioneer Theatre in Salt Lake City. Read it here. Next month my new play Speculator Spirits gets a weeklong workshop at the Pioneer Theatre Company in Salt Lake City. The play’s a comedy about a young woman who brings her new fiancé back to her estranged father’s haunted liquor store. It’s supposed to be a quick trip back to her home town, but a high-school football hero ex-boyfriend trying to relive the good old days, a single mom on a solo girls-night out, and the ghost of the bear-wrestling town founder have other plans. I’m really looking forward to working with director Wes Grantom again, who directed a reading of the play at Slant Theatre Project in December. If you’re in the Salt Lake area on February 20th or 21st, check the theatre website for times and stop by. It was great fun writing and acting with this crowd. I hope we get the chance to do it again sometime. 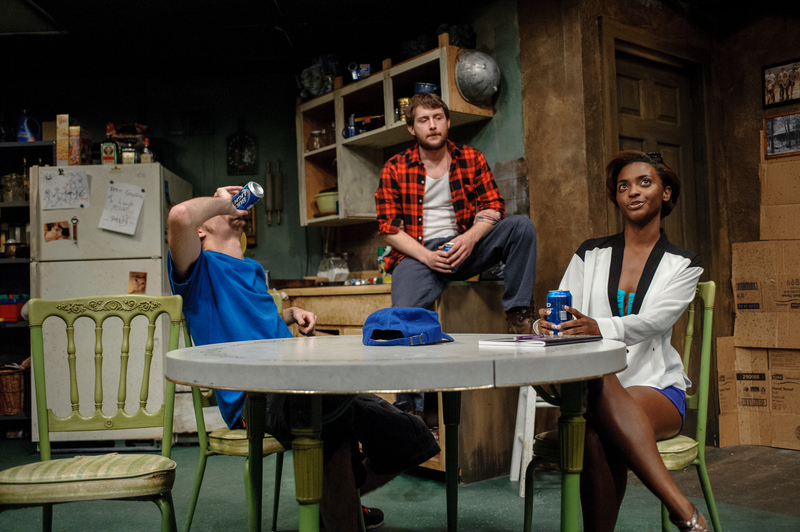 Austin Bradley, Eric McCowan and Jascha Thais in the UAH production of Spoon Lake Blues. Photo by Jeff White. 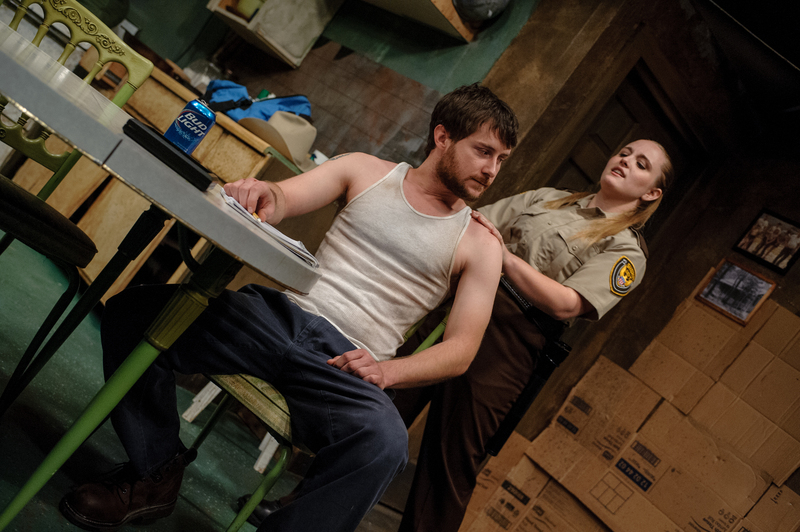 Eric McCowan and Kailey Looper in the UAH production of Spoon Lake Blues. Photo by Jeff White. 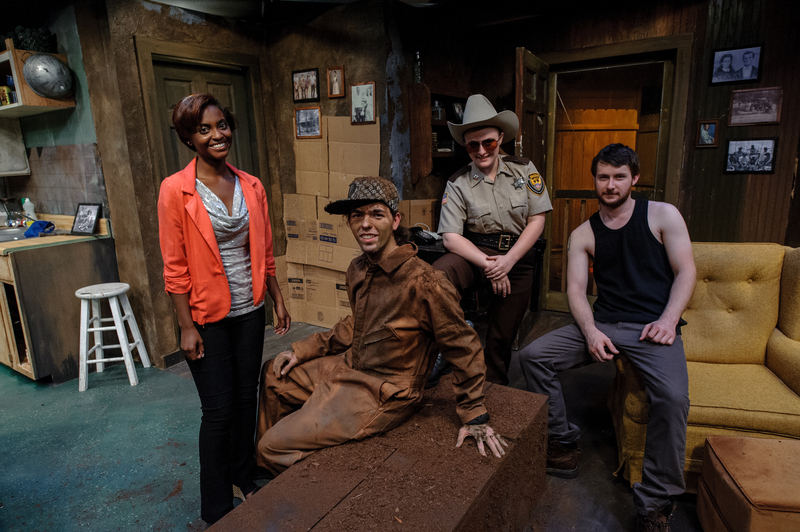 Jascha Thais, Austin Bradley, Kailey Looper and Eric McCowan from the UAH production of Spoon Lake Blues. Directed by Shannon Graham and designed by David Harwell, Johnna Doty and Caleb Grissett. Photo by Jeff White. 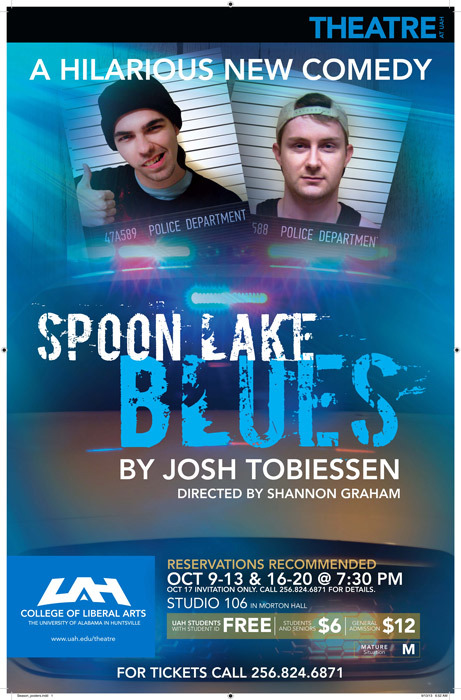 Those of you in the Alabama area this month can check out a production of my play Spoon Lake Blues at the University of Alabama in Huntsville. I’ll be there for a couple of days to check out the show and offer a short workshop. Can’t wait to see these characters again, I’ve missed them. If you want more information on this production here’s a link to a local article. “The Balcony Play” is a new short comedy I wrote for the ZaCH Theatre in my new home town of Austin. 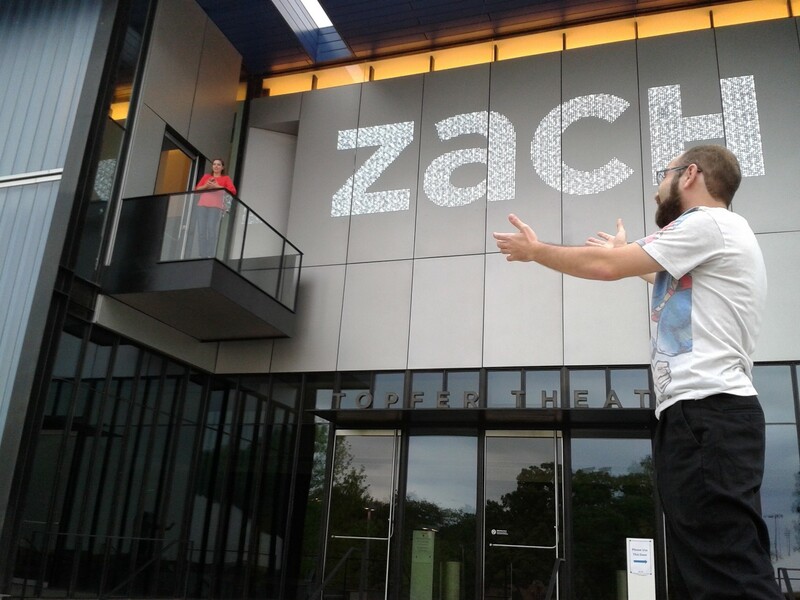 The mission was to write a short play to be performed outside the ZaCH’s new Topfer Theatre using the unique architecture outside the entryway to the theatre (which includes a ‘Juliet’ balcony). What came out of that was a comedic riff on famous stage romances as a young woman stuck on a balcony finds herself wooed by competing suitors from her past and present. The process has introduced me to some of Austin’s finest comedic talent and has given me a chance to get back to the site-specific work that was such a blast with Catastrophe Theatre Co. in Galway, Ireland. The show runs through most of April at 7:15 (before Steven Dietz’s new play “Mad Beat Hip and Gone”) and stars Jeff Britt, Mike Ferstenfeld, Kelly Matthews and Kyle Traughber with Steven Wilson directing. Oh, and it’s free. Click here for all the dates and times.